Buying a kamado grill is hard. Kamados are expensive and it is rare to find different brands side by side at a retail location so you can do a hands on comparison. It’s difficult to know if you are making the best choice and you don’t want to make a costly mistake. I have spent the past few weeks travelling around, putting my hands on as many brands of kamados as possible, talking to my buddies that own these and going to town on YouTube videos. Let me walk you through what I have learned to help you find the best kamado grill for your needs and budget. Let’s start with the elephant in the room. Big Green Eggs are excellent, high quality cookers and the brand has an army of fanatical devotees. That being said, the BGE is NOT the best product on the market. At one time the BGE was the best product out there. However, for the past ten years BGE has relied upon their reputation and marketing and have not improved their product. Others brands have taken this opportunity to make better products and dethrone the BGE as the best ceramic smoker. The best kamado grills are currently being made by Kamado Joe. Lets look at these cookers head to head with the Big Green Egg so you can see what makes the Kamado Joe products better. 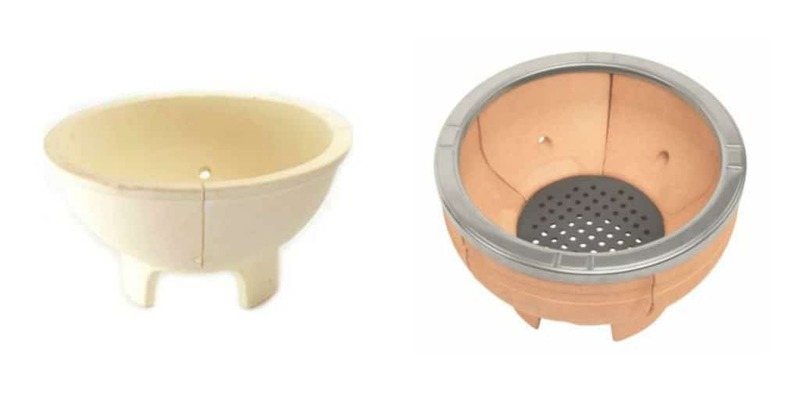 All ceramic smokers need a gasket between the body and the lid to form an air tight seal. The industry standard is to use a felt gasket that wears out and needs to be replaced annually. The Big Green Egg uses the standard felt gasket. 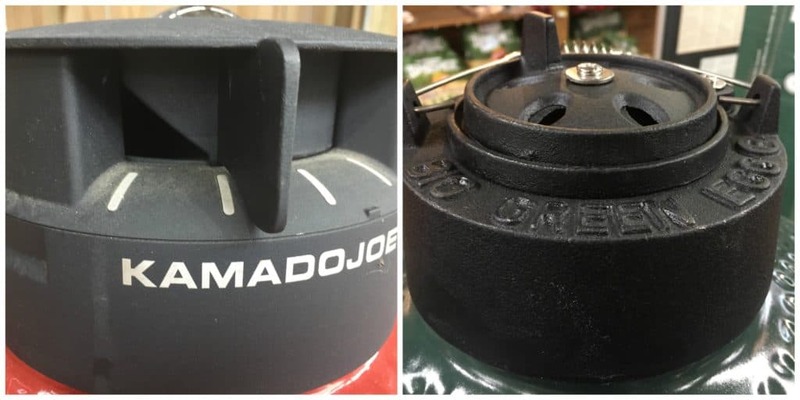 Kamado Joe realized that people didn’t like having to replace the felt gasket every year so they came up with something better. The gasket on a Kamado Jo is metal and fiberglass material that lasts much longer than felt. 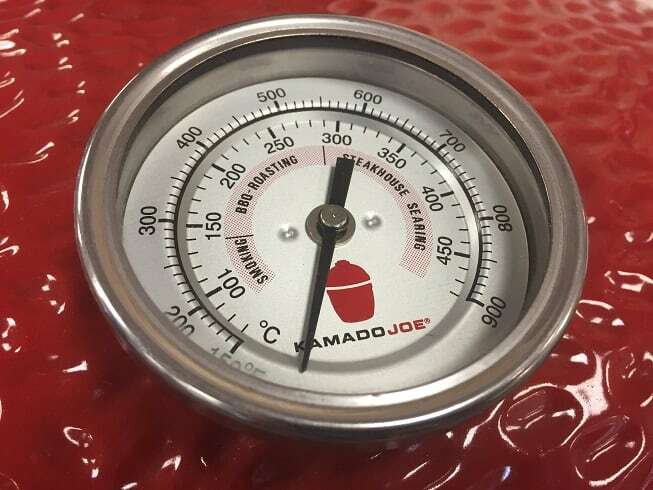 In addition, Kamado Joe has added a easy release latch on the front of the grill to ensure the top and bottom gaskets form a tight seal every single tme. The lids on all ceramic grills are heavy which makes the hinge design very important. The hinge on the Big Green Egg is functional and does reduce the amount of force needed to raise and lower the lid. However it is a very basic design and needs to be either fully opened or fully closed. Kamado Joe introduced a revolutionary “Air Lift” hinge for their lids. The Air Lift hinge reduces the force needed to open the lid by 96%. You can also keep the lid partially open without it slamming back down. The top air vent design is a subtle difference that shows Kamado Joe has been paying attention and responding to consumer needs. The air vents on the Big Green Egg open on the TOP of the air control. The air vents on the Kamajo Joe open on the SIDE of the sir control and are partially covered by an extended cap. Cleaning the ashes out of a kamado is not a lot of fun. Typically you uses a long handled metal scraper to scoop the ashes out of the firebox and into a disposal pan. Kamado Joe decided to make life easy and has a slide out ash catcher for easy removal of ashes. When you own a ceramic grill there is a strong chance that eventually you will end up with a cracked firebox. It just happens. 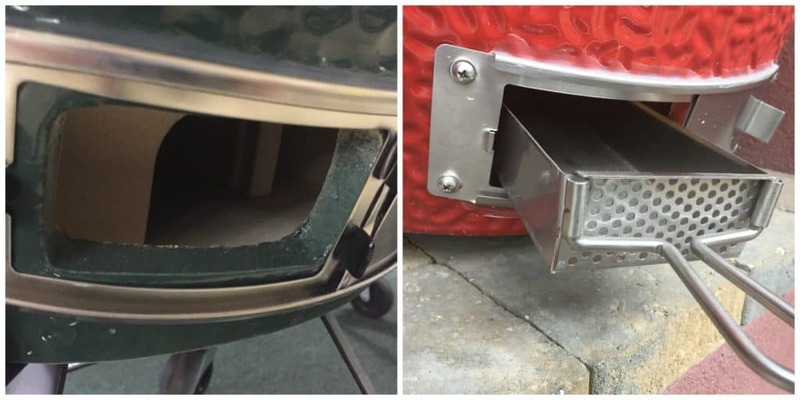 The firebox on a Big Green Egg is a single component that is expensive to replace. The firebox on a Kamado Joe is made up of six individual panels. If you get a crack in the firebox of a Kamado Joe then you only need to replace the single cracked panel and not the entire firebox. The final nail in the Big Green Egg’s coffin is the rotisserie developed by Kamado Joe called the “Joetisserie”. 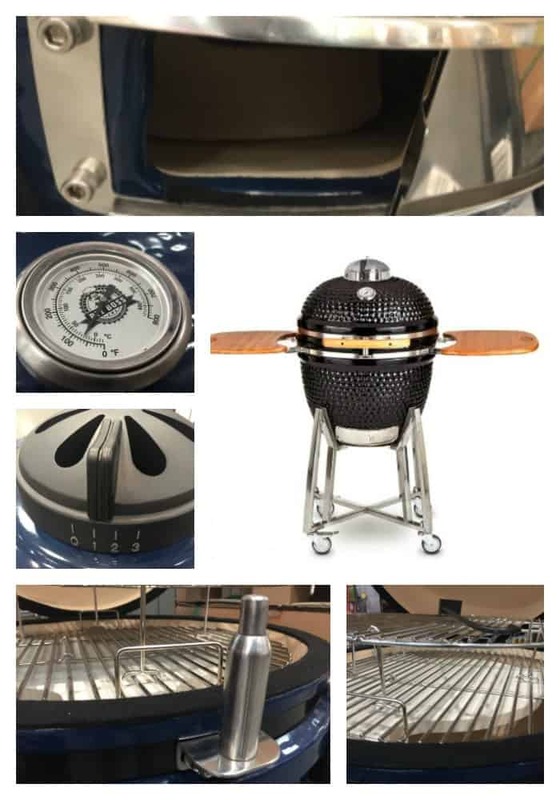 The Joetisserie fits both the Kamado and the standard BGE but Kamado Joe gets MASSIVE credit for developing something that so many ceramic grill owners wanted. Here is a great video of the Joetisserie in action. As long as I am posting videos I figure that this video from Baby Back Maniac would be super useful for you as well. The Baby Back Maniac videos are funny and informative…I seriously advise you to check out his review and then subscribe to his channel. Kamado Joe grills come in three sizes and a stand alone version is also available. I can’t talk about the best ceramic smokers without giving a shout out to Primo Grills. Like the BGE and Kamado Joe, Primo Grills are among the highest quality products that you can buy. I love the Primo’s oval design which I think lends itself to more efficient use of the grill surface a a better configuration for dual zone heating. The reason I like Kamado Joe better is that the Primo has the same issues with the felt gasket, top vent and ash removal as the BGE. The lid hinge on the Primo is also lacking…it takes a lot of effort to lift the lid on a Primo. The only problem with the Kamado Joe grills is that some people cannot afford them. The answer to that problem is solved by the Pit Boss ceramic grills. The Pit Boss products are made in China knock offs of the Big Green Egg. 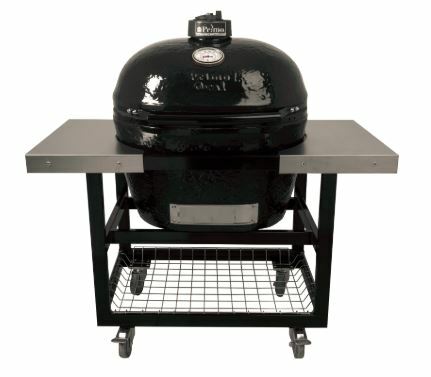 While the Pit Boss is not as nice as a Kamado Joe the price tag is about 40% less. The biggest quality issue with the Pit Boss grill is the bottom air vent is not “tight” against the grill and leaks air. The leaky air makes it hard to run this grill at steady Low and Slow Temperatures. 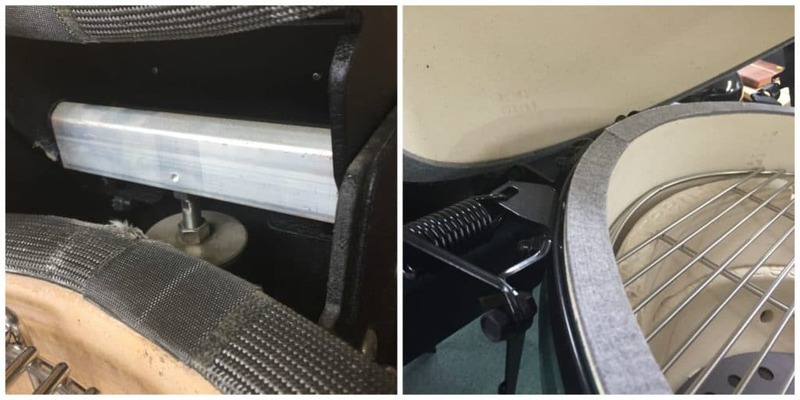 There are several ways to fix the air leak including adding a felt gasket or using high temperature silicon. Here is the video promo for these grills from Pit Boss. I would but the Pit Boss instead of the Big Green Egg any day of the week and save myself a ton of cash. 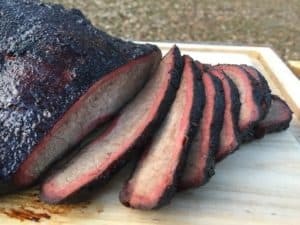 The Pit Boss is not as nice as the Kamado Joe by any stretch of the imagination but might be the answer for you if you are on a tight budget. There is a link below to see the Pit Boss on Amazon but there is a good chance that you can find one at your local Walmart or Home Depot.